The European Union (EU) and its immediate neighbours in the European Free Trade Association (EFTA) count 40 internal land borders 1 . Over the past decades, the European integration process has helped internal border regions to transform from mainly peripheral areas into areas of growth and opportunities. The completion of the Single Market in 1992 has boosted EU productivity and reduced costs through the abolition of customs formalities, harmonisation or mutual recognition of technical rules and lower prices as a result of competition; intra EU trade has increased by 15% over 10 years; additional growth has been generated and around 2.5 million more jobs have been created. These changes have had both a positive effect (freedom of movement has increased local cross-border interaction) and a negative effect (customs administration and related services employment have decreased) on border regions 2 . In general, there have been more opportunities to develop joint services and activities locally. Article 174 of the Treaty on the Functioning of the European Union recognises the challenges faced by border regions and stipulates that the Union should pay particular attention to these regions, when developing and pursuing actions leading to the strengthening of the Union’s economic, social and territorial cohesion. Since 1990, Interreg funding has supported cross-border cooperation programmes along EU border regions including those with EFTA countries. It has financed thousands of projects 3 and initiatives that have helped improve European integration. 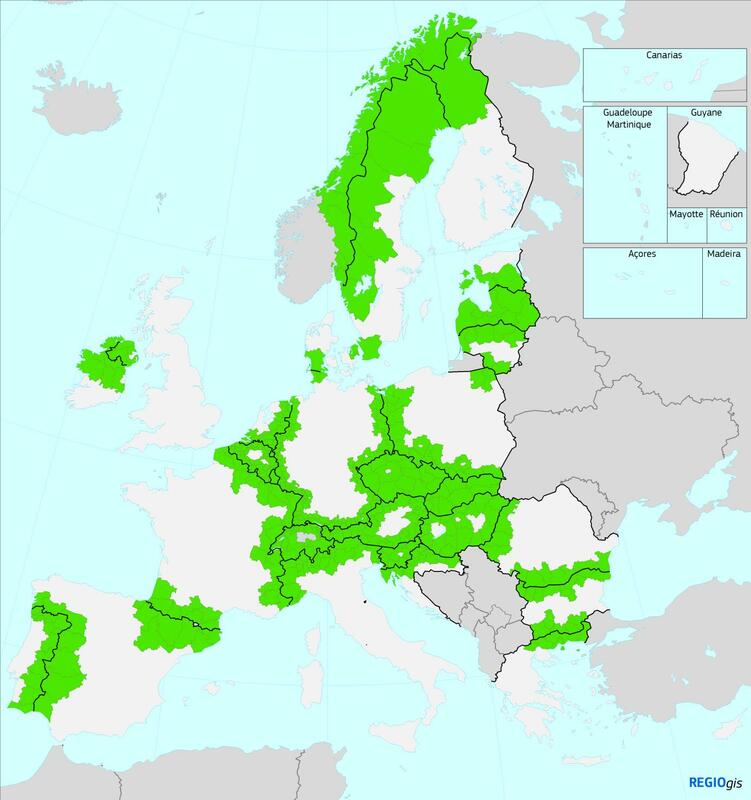 The main achievements of Interreg programmes include: increased trust, higher connectivity, improved environment, better health and economic growth 4 . From people-to-people projects, through to infrastructure investments and support to institutional cooperation initiatives, Interreg has made a genuine difference to border regions and has contributed to their transformation. This work continues today, with just under EUR 6 billion from the EU budget earmarked for the Interreg 2014-2020 cross-border programmes. These are implemented on all borders, ensuring that further progress can be made on integration and that the full potential of border regions can be realised. Investments to improve living conditions will be significant: joint environmental actions and joint measures to mitigate climate change effects will lead to greater protection of border populations. Joint research initiatives and facilities will further exploit the economic and innovative potential of border regions. Smart specialisation strategies will scale up regional and local innovation, including across borders 5 . The Investment Plan for Europe, re-enforced and extended in 2016, will also contribute to the development of border regions. Its third pillar, which aims to remove barriers to investment, will provide a more favourable environment for cross-border investment projects 6 . Border regions are places where the European integration process should be felt most positively - studying, training, working, caring and doing business across borders are all daily activities that should be possible regardless of the existence of an administrative national border. However, evidence gathered by the Commission demonstrates that border regions generally perform less well economically than other regions within a Member State. Access to public services such as hospitals and universities 7 is generally lower in border regions. Navigating between different administrative and legal systems is often still complex and costly 8 . Individuals, businesses, public authorities and non-governmental organisations have shared with the Commission their at times negative experiences of interaction across internal borders. Measures that go beyond European funding are needed as these ongoing difficulties cannot be addressed through financing and investments alone. This Communication highlights ways in which the EU and its Member States can reduce the complexity, length and costs of cross-border interaction and promote the pooling of services along internal borders. It looks at what needs to be improved to ensure that border citizens can take full advantage of the opportunities offered on both sides of the border. Thus, the EU can boost its border regions even further and help generate growth and jobs. This Communication aims to bring the EU closer to its citizens and to ensure that the European legislative process works effectively in favour of individuals and businesses. The White Paper on the Future of Europe 9 and the subsequent reflection papers launched a wide-ranging debate on how Europe should evolve in the future so it can best meet the aspirations of all Europeans. Territorial cooperation and cross-border cooperation in particular have been widely acknowledged as bringing genuine added-value to Europeans. This Communication also contributes to this reflection process by proposing measures and issuing recommendations that make it easier for internal land border regions to cooperate, contribute to reducing hurdles and help border citizens and businesses use the full potential of these regions. Following an online public consultation in all the EU languages and subsequent research and exchanges with stakeholders 10 , the Commission has uncovered a number of problematic issues facing border businesses and individuals. Although not always specific to border regions, these issues are particularly acute in these regions because of the frequency and level of interaction across the border. ØCompanies doing business across borders spend 60% more than businesses operating domestically to carry out key procedures mainly because of additional translation and certification costs 11 . These stories show that many aspects of border life are over-complicated and burdensome. At the same time, the public consultation and study have highlighted a number of very positive examples of European integration and opportunities offered by border regions. ØIndividuals can also effectively organise themselves to represent their common interests as demonstrated by the Groupement Transfrontalier Européen 12 , an association representing over 30,000 commuters between Switzerland and France. Inspirational examples like these where opportunities linked to the presence of a border have been used to the benefit of border populations are too few and far between. The Commission has undertaken analytical work exploring the cost of border complexities and the duplication of services. A recent study 13 on the economic impact of border obstacles on GDP and employment levels in internal land border regions suggests that these regions could on average be potentially 8% richer if all current barriers were removed and a common language was used by all 14 . This scenario is neither attainable nor desirable as Europe is built on diversity and subsidiarity. However, if only 20% of the existing obstacles were removed, border regions would still gain 2% in GDP. The estimated impact on jobs is equally important, with potential for over 1 million jobs. Border barriers currently limit the use of productive assets or make it difficult to achieve economies of scale. They also generate costs for individuals and businesses. This negative economic impact varies between Member States, but is clearly higher in countries where border regions generate a significant proportion of national GDP. The evidence also shows that there are no easy fixes and that the emergence of border issues and their resolution is a complex process that involves all levels of government and public administrations. As many stakeholders reported, border difficulties are always felt locally, although the solutions are seldom found locally. Overcoming obstacles or reducing complexity requires that all levels of government and administration work hand in hand. This chapter highlights areas identified in the Commission's preparatory work with stakeholders (study, consultation and workshops) as having great potentials to remove further hurdles. It outlines the role of the Commission in taking positive steps both in its own actions and in support of other key players. Each section briefly describes the issues identified and uses examples and/or good practices to illustrate them (these are outlined more in detail in the accompanying Staff Working Document). It also offers a brief insight into ongoing measures by the Commission or national institutions and finally, where possible, proposes new actions by the Commission or recommends actions for Member States and other stakeholders. The implementation of the 10 actions listed below will be facilitated by the creation of a "Border Focal Point" within the Commission. The functions of the "Border Focal Point" will be to (1) ensure that key future actions by the Commission take due account of cross-border regional dimensions, (2) provide Member States and other key players with support to address legal and administrative border regional issues, notably relating to the transposition of EU directives or coordination requirements, (3) make sure that practical arrangements are in place for new actions stemming from this Communication, (4) share experiences and good practices effectively and widely with relevant stakeholders. New initiatives by the Commission will not have the full desired positive impact in border regions if effective mechanisms for cross-border cooperation are not deepened. These mechanisms, whether institutionalised or not, need to reflect the multi-level government dimension of policy-making in the EU. A number of such cooperation mechanisms already exist. Good practice: At inter-governmental level, the Nordic Council of Ministers and the Benelux Union have established processes to identify and address bi-lateral border barriers. At regional level, the Upper Rhine Conference or the Greater Copenhagen and Skåne Committee have developed institutionalised ways to identify local obstacles and organise a response. The Commission calls upon Member States and regions to further develop regular dialogues on border issues. Essential European integration notions such as mutual recognition or alignment of rules and processes should receive more attention from Member States and regions. They are invited to take full advantage of existing opportunities to conclude agreements or conventions. For example, the four macro-regional strategies 15 could provide an appropriate framework for cross-border institutional cooperation. In addition, where cooperation is an explicit requirement of EU legislation, as is the case for instance in many environmental legal acts, this should be used to full effect. Action: To support this process and to ensure that good practices are shared, the Commission will establish an EU-wide online professional network where legal and administrative border issues and solutions can be presented and discussed between border stakeholders. This network will use Futurium - an already existing online platform created by the Commission - and will be moderated by the Commission via its Border Focal Point. Action: In addition, the Commission will launch an open call for pilot projects before the end of 2017. It will target public authorities wishing to resolve one or more border-specific legal or administrative problem(s). Projects could for example be focused on improving compatibility of administrative systems, facilitating labour mobility through enhanced opportunities for qualification recognition or ensuring harmonisation of legal standards. These projects will serve as a basis for exploring innovative ways to address border issues. Their results will be summarised in a final compendium that will be widely distributed and used to foster greater awareness and capacity among key players. The call will be open to any public body willing to engage in identifying solutions to border issues within their area of competence. Up to 20 pilot projects will be selected for their high demonstration value and level of replicability. For a considerable share of the border difficulties identified, root causes have been attributed to the existence side by side of different regulations in national legal and administrative systems. Even where there is a European legal framework, Member States have a degree of flexibility and discretion in the way they transpose this legislation in their national systems. Often certain levels of standards stipulated in EU law are incorporated at varying degrees of stringency in various Member States. As a result, when two different systems meet along internal borders, this may create complexity - and sometimes even legal uncertainty - and generate additional costs. Example: Directive 2014/24/EU of the European Parliament and of the Council of 26 February 2014 on public procurement contains 19 instances where minimum standards apply, for example on setting specific time limits. This creates 19 potential occasions where cross-border public procurement can be particularly difficult, as certain Member States will apply longer deadlines than others. In its Better Regulation package adopted in 2015 16 , the Commission has proposed measures to ensure that territorial aspects are factored into policy options. This happens mainly through the implementation of robust impact assessments of legislation that include territorial elements. Good practice: An independent body (Institute for Transnational and Euregional Cross-Border Cooperation and Mobility of Maastricht University) carries out cross-border impact assessments of future national and EU legislation based on a work programme developed together with national, regional and local border stakeholders along the borders of the Netherlands with Germany and Belgium respectively 17 . Action: The Commission will make further efforts to identify cross-border impacts whenever significant through the application of the existing methods and tools. Via its Border Focal Point and the professional network described above, the Commission will seek greater involvement by border stakeholders in this process. Action: To support Member States with necessary coordination efforts during their national transposition process, the Commission's Border Focal Point will organise expertise and advice on cross-border regional aspects. This will build among others on the results of the pilot projects mentioned above and on existing good practices. EU Member States have different administrative cultures and systems. This diversity can be a constraint when different systems meet. Most administrative procedures tend to be of a national nature and cross-border procedures are less widespread. However, border stakeholders may well require non-domestic procedures on a regular basis. The lack of common approach or understanding, and the limited existence of mutually recognised documents can lead to lengthy and costly procedures, even for key life events. For example, some public authorities have embraced e-government faster than others – this can lead to difficulties in border interaction especially when documents or forms are needed. Where e-government solutions are being implemented, these apply more to the domestic context than to a cross-border perspective 18 . Interoperability of public authorities' e-systems is still limited. Example: Interaction between individuals and public authorities in Denmark is digitalised to a large extent. Getting the necessary identification and access rights can be complex for cross-border commuters based in neighbouring countries. For example, tight deadlines for issuing the tax identification number (skattepersonnummer) can cause delays in arranging employment contracts and health insurance. Handling certain issues outside of the digital systems carries the risk of delays and missed deadlines. In its e-Government Action Plan 2016-2020 19 , the Commission sets out a long-term vision for open, efficient and inclusive public administrations, providing borderless, personalised end-to-end digital public services. Although of a general nature, the plan proposes measures and tools which will be particularly relevant for border regions such as the once-only principle (i.e. information is supplied to public authorities only once regardless of country of origin 20 ) and an automated translation tool for public authorities 21 . Action: Member States' and regional/local authorities need to rise to the challenge of e-government and take concrete steps that will make a difference to border citizens. The Commission will support this process by actively promoting existing e-solutions among border stakeholders and among public authorities most concerned by cross-border data exchanges. To this end, the Commission will urge its ongoing and future e-government projects to engage border stakeholders in order to deliver cross-border public services that meet the needs of individuals and businesses. Successful on-going projects such as the mutual recognition of eID or the Electronic Exchange of Social Security Information (EESSI) provide a strong basis for this. Resolving border obstacles will take time and sustained effort. In the meantime, access to available and reliable information and problem-solving services on life or work on the other side of the border is vital. Preparatory work for this Communication has highlighted concerns by individuals and businesses at the lack of reliable information services which can lead to legal uncertainty that hampers cross-border interaction or makes the implementation of cross-border projects longer and more costly. Good practice: Initially financed by Interreg, the Infobest 22 network of one-stop-shops in the Upper Rhine tri-lateral border region between France, Germany and Switzerland currently provides reliable information to individuals about all aspects of cross-border life, including employment and education and supports cross-border interface with the different public authorities. Europe-wide services and tools such as Your Europe, the Internal Market Information System and the SOLVIT network are useful in this context. Action: The Commission has recently proposed the "Single Digital Gateway" (SDG) 23 draft regulation which once adopted will enable individuals and companies to have easier access, through a single digital entry point, to high quality information, online administrative procedures and assistance services. The SDG envisages the first application of the once-only principle at the EU level by enabling the exchange of evidence directly between competent authorities from different Member States for a set of key procedures. It will also encourage feedback from its users to constantly evolve to meet their needs and to collect information about single market barriers. Action: In its recently adopted Communication "Action plan on the reinforcement of SOLVIT: bringing the benefits of the Single Market to citizens and businesses" 24 , the Commission commits to further reinforce SOLVIT with the Member States so that more individuals and businesses have their cross-border issues addressed. Preparatory work has identified labour mobility as the most important area directly affected by border obstacles. This particularly concerns cross-border workers who live on one side of the border and travel to work on the other side of the border on a daily or weekly basis 25 . A number of tools and coordination mechanisms exist at European level to facilitate cross-border work such as the European network of employment services (EURES), rules for the coordination of social security systems, the European Qualifications Framework which supports understanding and comparison of qualifications, the Europass Framework which enables individuals to communicate their skills and qualifications, the European classification of skills, competences, qualifications and occupations and the European Professional Card, an EU-wide digital procedure for the recognition of professional qualifications. In terms of financing, both the EU programme for Employment and Social Innovation (EaSI) and the European Social Fund provide support for labour mobility in border regions. The EURES axis of the EaSI programme supports cross-border partnerships that provide cross-border workers and their employers with information and placement services. Good practice: The Social Security and Labour Inspection of Galicia and that of North Portugal have created a network supported by the local EURES cross-border partnership, which allows a faster resolution of obstacles to cross-border mobility of employers and workers. They have developed effective collaboration bridges between Social Security organisms and Labour Inspection in the cross-border region. However, the positive effects of those measures/tools have not achieved their full potential in border regions. There is still room for improvement in processes such as: completing an apprenticeship, having one's skills and competences fully recognised, accessing job vacancies, identifying workers, obtaining legal certainty on fiscal issues, securing full social security coverage, obtaining professional insurance for medical staff, complicated procedures to obtain professional certificates. Information provision, including to individuals and employers, as well as data collection for decision-making are other areas to be improved. Action: Member States and regional authorities are encouraged to reinforce cooperation between public employment services in border regions including joint cross-border employment services to improve access to information and to jobs in the cross-border labour market. Existing practices will be made more widely available using the proposed professional network mentioned above. The wealth of cultures and traditions across Europe is a great asset. Multilingualism is a European integration goal. The ability to speak foreign languages is also increasingly important to boost employability, mobility and competitiveness, which is of particular relevance in border regions. Good practice: The "France-strategy", which was adopted by the German region of Saarland 26 in 2014, promotes a bilingual approach at all levels of administration. It is supported by a curriculum including compulsory French, starting in preschool. As a result, more than half of all kindergartens in the area are bilingual. Yet, language has been highlighted as a source of difficulty by many during the public consultation for this Communication. The experience of border stakeholders often points to cases where the inflexible use of different languages on both sides of a border increases the administrative burden as well as hampers meaningful exchanges between public administrations and individuals. The Commission is pursuing a strategy endorsed by the Council and based on the objective defined by the EU Heads of State and Government that all citizens should have the opportunity to learn two foreign languages from an early age 27 . In border regions one of these languages can ideally be the language of the neighbours. Language learning is also an over-arching priority of the European funding programme for education, training, youth and sport: Erasmus+. The programme can support language learning in border regions in many ways. Action: Member States, regions and municipalities are urged to use life-long learning opportunities to step up efforts to promote bilingualism in border regions. Existing good practices should be a source of inspiration and will be further promoted by the Commission. Existing funding instruments such as Erasmus+ or the Interreg cross-border cooperation programmes will be used to support this where appropriate. Transport is a key enabler of exchanges between regions across national borders. Especially public transport services not only help integration processes but also enhance the sustainability of cross-border connectivity. Lacking, insufficient or low-quality public transport services are still a reality for many citizens in border regions. This concerns three levels: 1) infrastructure connections, 2) service provision and 3) the quality of services. Especially smaller scale railway infrastructure is lacking or inoperative in a number of cases along internal EU borders; owing to a range of difficulties (e. g. diverging priorities, different legal/procedural/organisational approaches, budgetary constraints). Good practice: Interreg finances cross-mobility projects, most of which can be found in the KEEP 28 database. For example in the tri-lateral border area between Germany, the Netherlands and Belgium, public transport providers have developed a common platform (http://mobility-euregio.com) with combined timetables, joint pricing and a modernized ticketing system. On the German-Swiss border, a new bus line was established between Grenzach-Wyhlen (DE) and Basel (CH) to accommodate the 1,900 local commuters (out of a total population of 14,000 people). At EU level greater harmonisation and coordination of technical and legal standards, together with achieving interoperability in the transport sector are high priorities. Coordination and harmonisation have been successfully achieved in the field of TEN-T which may serve as an example for other policy fields beyond transport. For example, when it comes to the provision of EU-wide multimodal travel information services, upcoming EU legislation will provide appropriate framework conditions to enable all the relevant stakeholders along the travel information value chain to cooperate 29 . Action: A Commission study of missing rail links along internal borders will be available in 2018. It will be shared with stakeholders via the Border Focal Point. Action: The organisation and implementation of cross-border public transport services is a competence that lies at national, regional and local level. Member States, regions and municipalities are therefore urged to step up their efforts to provide individuals with better quality, more integrated public transport services. The Border Focal Point will make good practices available and provide expert advice where possible. Encouraging cooperation between the Member States to improve complementarity of their health services in border regions is a priority for the EU 30 . Different structures and principles exist for the reimbursement of cross-border healthcare resulting in e.g. different and complex procedures for the prior authorisation of healthcare services and payments/reimbursements; administrative burden for patients dealing with cross-border consultations with specialists; incompatibilities in the use of technology and in the sharing of patient data; lack of unified accessible information, which also includes a lack of information in the patients' language. Limited accessibility from both sides of the border therefore hampers the full use of the health care facility. Emergency and rescue services are also sometimes impeded in carrying out cross-border interventions. Good practice: The institutionalised agreement establishing seven organised cross-border health care zones on the Franco-Belgian border 31 has been used by more than 20,000 patients who have received health care closer to their residence in the neighbouring country. Action: A comprehensive mapping of cross-border health cooperation across the EU by the Commission will identify good practices and analyse future challenges. It will be available in 2018 and will be shared with stakeholders via the Border Focal Point. The Commission will during 2018 also organise a strategic event to highlight good practices of cross-border health cooperation and explore ways in which this can be further developed throughout the Union. The EU has introduced a number of legal and financial tools to facilitate cooperation across European borders. For example, the European Grouping of Territorial Cooperation 32 enables entities from two or more Member States to work together under a common structure with legal personality. This facilitates cross-border cooperation in many cases and gives regional and local authorities a way to cooperate without the need for an agreement ratified at Member State level. However, their wholly institutional nature is not always suitable for resolving legal and administrative obstacles. Good practice: The EGTC Lille-Tournai-Kortrijk Eurometropolis 33 is the largest cross-border metropole in Europe. It brings together 14 institutions from France and Belgium (national authorities, regional and local authorities, development agencies) which work together to erase the "border effect" and make day-to-day life easier for its 2.1 million inhabitants. Action: A number of Member States are considering the merit of a new instrument which would make it possible, on a voluntary basis and agreed by the competent authorities in charge, for the rules of one Member State to apply in the neighbouring Member State for a specific project or action limited in time, located within a border region and initiated by local and/or regional public authorities. The Commission services closely follow this work. Taking into account the evidence provided by the pilot projects mentioned above in section 3.1, the Commission will consider options to take this instrument forward. Action: Member States and the European institutions should engage early in a dialogue to explore how future funding programmes can make a more strategic contribution to the prevention and resolution of border obstacles and the development of cross-border public services. Collecting data and evidence on border obstacles is the first necessary step towards resolving them but only limited resources are invested in collecting and analysing information on border difficulties and complexities. Excellent examples of information collection and analysis exist in France 34 and in Hungary 35 . Similarly, the limited availability of statistical and geospatial data on cross-border flows reduces the scope for genuine cross-border policy development and decision-making. A few regional efforts have been made that other regions could build upon. Good practice: The data portal for the Greater Region 36 in and around Luxembourg collects data from five national and regional statistical offices to provide policy-makers with evidence of cross-border flows and territorial trends in an area characterised by high level of interaction (e.g. 200,000 cross-border workers). Statistical and geospatial data describing cross-border flows and phenomena is not always sufficiently available or standardised to allow policy-makers to take informed decisions. Member States, under the coordination of the European Statistical Office should explore innovative data collection methodologies (e.g. geo-referencing or geocoding) ready for cross-border analysis such as grid-based data. Action: The Commission is financing a one-year pilot project with statistical offices to test the potential use of labour force survey data, administrative and census data, and mobile phone data. This collaborative work with Member States should be pursued and re-enforced based on the outcome of the pilot project available in 2018. Action: The Commission is working with the European Observation Network for Territorial Development and Cohesion (ESPON) territorial cooperation programme to further promote territorial research linked to border regions. The Commission is also building upon successful territorial research activities funded by the Seventh Framework Programme for Research and Technological Development, Horizon 2020 as well as via the Joint Research Centre. This work will be used by the Border Focal Point to promote informed decision-making in response to challenges faced by border communities. EU internal border regions contribute significantly to the socio-economic wealth of Europe. They are geographic areas where European integration processes are experienced in everyday life by individuals, businesses and public authorities. Evidence shows that much can be gained by reducing the negative impact of the territorial, legal and administrative discontinuities which persist in border regions. Action at EU level, in cooperation with Member States, regions and other stakeholders is required to better use the potential of border regions. The Commission has a key role to play in this regard. It can take direct action in its areas of competence when proposing legislation or funding mechanisms. Just as importantly, it can also support Member States and regions to better understand the challenges and develop operative arrangements, notably by promoting information sharing and showcasing successful practices. The EU budget has contributed significantly to the development of border regions over the past 25 years. Future funding programmes should continue to do this in the most effective and efficient manner, focusing on areas of particular high EU value added. Consideration could be given for instance to ensuring that solving border difficulties is at the heart of cross-border cooperation programmes. Similarly, gaps and missing links in different policy fields, including transport, should be a central part of those programmes. Finally, the pooling of joint public services in neighbouring border regions and institution-building needs could also be taken into account. Member States and regions too have a central role to play in this process – they need to act in areas where they are competent in order to prevent obstacles from emerging and to resolve those which already exist. They should give serious consideration to greater coordination (e.g. when transposing EU law), more mutual recognition and closer alignment with each neighbour. The Commission will take action still in 2017 and in the coming years as outlined above. The Border Focal Point will soon become operational so that the proposed actions can be implemented swiftly. The objective is to demonstrate that border regions can increase their contribution to the socio-economic well-being of EU citizens while also becoming living labs of European integration for the benefit of European territories and their inhabitants. (1) EFTA: Norway, Switzerland and Liechtenstein. Iceland only has maritime borders with the EU. See the map on p. 3. (2) For statistical reasons, data and information is based on NUTS 3 regions under the European Nomenclature of territorial units for statistics: http://ec.europa.eu/eurostat/web/nuts . (3) Projects are listed in the KEEP database, which is financed by Interreg: www.keep.eu . (4) The top five achievements were highlighted in 2015 during Interreg's 25th anniversary celebrations. (5) Communication from the European Commission 'Strengthening Innovation in Europe's Regions: strategies for resilient, inclusive and sustainable growth', COM(2017) 376 of 18 July 2017: http://eur-lex.europa.eu/legal-content/en/TXT/?uri=CELEX:52017DC0376 . (6) Investment plan: https://ec.europa.eu/commission/priorities/jobs-growth-and-investment/investment-plan_en . 'Territories with specific geographical features', European Commission, DG REGIO (2009), Working Paper No: 02/2009: http://ec.europa.eu/regional_policy/en/information/publications/working-papers/2009/territories-with-specific-geographical-features . (8) A border obstacle within the context of this Communication is not only a restriction on free movement as established by the European Court of Justice, but a law, rule or administrative practice that obstructs the inherent potential of a border region when interacting across the border. (9) European Commission 'White Paper on the Future of Europe', COM(2017) 2025 of 1 March 2017. (11) Ecorys Netherlands in association with Mazars, 'Study about administrative formalities of important procedures and administrative burdens for businesses', European Commission, April 2017: https://ec.europa.eu/growth/tools-databases/newsroom/cf/itemdetail.cfm?item_id=9134&lang=en , and Staff Working Document SWD(2017) 213 of 2 May 2017: http://eur-lex.europa.eu/legal-content/EN/TXT/?qid=1503565263778&uri=CELEX:52017SC0213 . (12) Le Groupement Transfrontalier Européen: http://www.frontalier.org/ . Politecnico di Milano (2017) Quantification of the effects of legal and administrative border obstacles in land border regions. (14) This calculation does not include the costs of removing the obstacles, for more information see footnote 13. (15) EU Strategy for the Baltic Sea Region, The EU Strategy for the Danube Region, The EU Strategy for the Adriatic and Ionian Region and The EU Strategy for the Alpine Region. (16) Communication from the Commission to the European Parliament, the Council, the European Economic and Social Committee and the Committee of the Regions 'Better regulation for better results - An EU agenda', COM(2015) 215 final of 19 May 2015. (17) Institute for Transnational and Euregional Cross-Border Cooperation and Mobility of Maastricht University: https://www.maastrichtuniversity.nl/research/institute-transnational-and-euregional-cross-border-cooperation-and-mobility-item . (18) European Commission's 'EU eGovernment Report 2016' shows that online public services improved unevenly, Digital Single Market, News, Digibytes, 3 October 2016: https://ec.europa.eu/digital-single-market/en/news/eu-egovernment-report-2016-shows-online-public-services-improved-unevenly . (19) European Commission 'EU eGovernment Action Plan 2016-2020 - Accelerating the digital transformation of government', COM(2016) 179 of 19 April 2016: https://ec.europa.eu/digital-single-market/en/news/communication-eu-egovernment-action-plan-2016-2020-accelerating-digital-transformation http://eur-lex.europa.eu/legal-content/EN/TXT/?qid=1503566265012&uri=CELEX:52016DC0179 . (20) European Commission 'The “Once-Only” Principle (TOOP) Project launched in January 2017', Digital Single Market, Project News and Results, 26 of January 2017: https://ec.europa.eu/digital-single-market/en/news/once-only-principle-toop-project-launched-january-2017 . (21) Machine translation for public administrations - MT@EC: https://ec.europa.eu/info/resources-partners/machine-translation-public-administrations-mtec_en . (23) Proposal for a Regulation of the European Parliament and of the Council on establishing a single digital gateway to provide information, procedures, assistance and problem solving services and amending Regulation (EU) No 1024/2012 of 2 May 2017: http://eur-lex.europa.eu/legal-content/EN/TXT/?uri=CELEX%3A52017PC0256 . (24) Communication from the European Commission 'Action plan on the reinforcement of SOLVIT: bringing the benefits of the Single Market to citizens and businesses', COM(2017) 255 of 2 May 2017: http://eur-lex.europa.eu/legal-content/EN/TXT/?uri=CELEX:52017DC0255 . (25) Cross-border workers (frontier workers) are defined as EU/EFTA citizens who live in one EU or EFTA country and work in another, moving across borders regularly on a daily or at least weekly basis, regardless of their precise citizenship (provided they are EU-28/EFTA citizens). (26) France Saarland Strategy October 2016: https://www.saarland.de/dokumente/ressort_finanzen/MFE_Frankreich_Startegie_LangDIn4S_UK_Lay2.pdf . (27) European Union - Council of the EU 'Council conclusions on multilingualism and the development of language competences', May 2014: http://eur-lex.europa.eu/legal-content/EN/TXT/?uri=CELEX:52014XG0614(06) . (29) To be implemented via a Delegated Regulation supplementing Directive 2010/40/EU. (30) Besides provisions mentioned in the Treaty itself, one can highlight the Directive on the application of patients’ rights in cross-border healthcare (2011/24/EU) and the EU-Regulation on the coordination of social security systems (883/2004). (31) Espaces Transfrontaliers, La Communauté de santé transfrontalière: http://www.espaces-transfrontaliers.org/ressources/themes/sante/sante-4/ . (32) Regulation (EC) No 1082/2006 of the European Parliament and of the Council of 5 July 2006 (OJ L 210, 31.7.2006, p. 19), as amended by Regulation (EU) No 1302/2013 of 17 December 2013 (OJ L 347, 20.12.2013, p. 303). (34) Mission Opérationnelle Transfrontalière: www.espaces-transfrontaliers.org . (35) Central European Service for Cross-Border Initiatives: www.cesci-net.eu . (36) Grand Région: http://www.grande-region.lu/portal/ .